Ice Cream.. the treat you never outgrow. From the very young to the very old, everyone loves the cool, refreshing taste of an old fashioned hand-dipped ice cream cone. 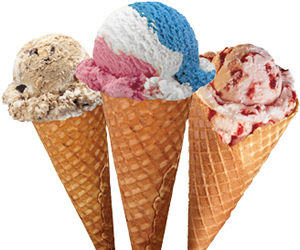 Ice Cream Churn® offers a variety of premium quality ice creams and yogurts that are specially formulated to appeal to consumers of all ages. Ice Cream Churn® was founded in 1973 in Byron, Georgia. Initially, a single store located inside a truckstop was added in hopes of providing additional traffic to increase overall sales. Five years later, with a successful, proven sales and marketing concept, the company began licensing add-on franchises to sell hand-dipped ice cream within other businesses under the trademark, "Ice Cream Churn®." ©2010 Ice Cream Churn. All Rights Reserved.